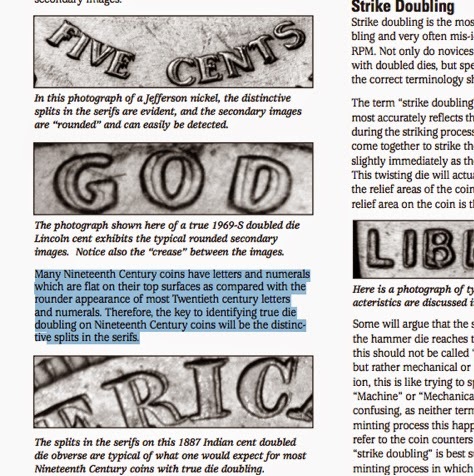 Tony Lawrence's Coins & Stuff: Why is MD (Machine doubling) worthless? Why is MD (Machine doubling) worthless? A recent thread at Collectors Universe asked "Is Machine Doubling ever worth a premium?" whatever happened to "buy what you like"? No premium applies to this type of error as it is strictly caused by the machine itself and not through true human error as it were. The loose coining press parts result from the continuous pounding of the presses as they strike coin after coin, and from wear on the coining press parts. The coining press operators have reported that when they see this doubling on the coins, all they have to do is grab their tools and tighten up all of the loose parts in the coining press. As soon as those loose parts are tightened, the doubling no longer occurs. I'd say loose parts are human error - or neglect, perhaps, but that's close enough for me. More likely the disrespect comes from how common this type of error is. Modern presses are very fast and strike very hard: keeping things tight is probably very difficult. That thought raised another question in my mind, though: is MD more common in modern coins than in older? 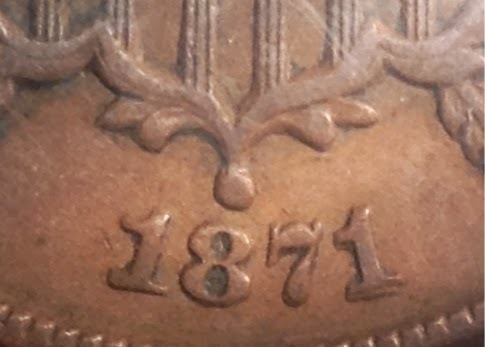 If you go look at the photo of the 1871 2 center at the [VP-002] link posted above, the notch at the lower right of the second 1 is very evident. If this coin were machine doubled, that notch would be filled in. I don't see the "notch". I know what he's talking about because Wexler says the same thing at the link I already mentioned. genuine doubled dies are characterized by a splitting of the serifs on letters with serifs, or a “notching” of the corners of the letters which are doubled. 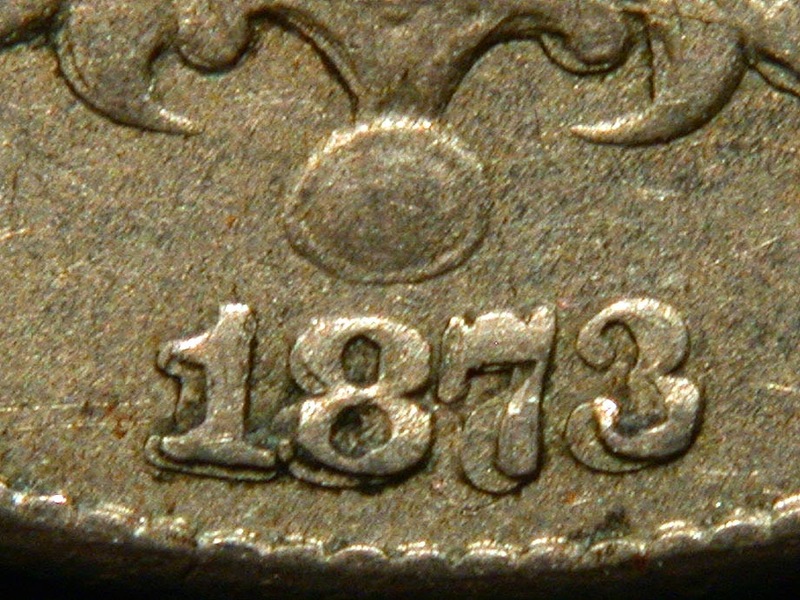 This splitting of the serifs or notching of the letter corners will not be found on coins with mechanical doubling. I did some Googling on split serifs and found "Determining Die Doubling from Other Forms of Doubling" by J.T. Stanton, but that also failed to clear my confusion. Think of machine doubling as a drawer sliding out from the device of the coin. The drawer must be full-width, because the slide is the same along the entire edge of the device. The notch shows us that this is not machine doubling, but (in the case of a 2-center) an RPD. From the very first, attempts were made to claim that doubling was caused by the die twisting at the moment of impact. A little thought will discount that theory, because you are dealing with a die which is meshing with the forming design on the coin under 25 or more tons per square inch of pressure. The amount of force needed to rotate the die under those conditions would run into the thousands of tons. If such a force were available, it would shove the entire design out of position. MDD always affects only part of the design, so this cannot be the cause. To prove my point, hold your hands together, with your fingers interlaced. Now, try and move one hand sideways without moving the other. The strike ends with the "final impact of the die pair." Die bounce or chatter involves only one die. While you can find MDD on both sides of a coin, the cause is different on each side as there are at least three forms of MDD, each with a different cause. He unfortunately neglected to explain the three causes. Fortunately I was able to find a page that does describe them - it's in the references. However, the "slide doubling" described there seems just as unlikely as "twist doubling", for the same reasons. I remain somewhat confused by this whole subject. Is Machine Doubling ever worth a premium? It sure does look really cool!!! Wexler's Double Die Site "Mechanical Doubling"
LAST CHANCE TO ENTER IS TODAY! What if you were robbed? I am not selling anything!